For the past week I have been studying the scriptures about prayer. One thing that keeps coming up is the need to keep a right relationship with God, keeping His commands. Today I am reading in 1 Samuel using the IEB and following the footnotes as I go. The IEB introduction to 1 Samuel indicates that 1st and 2nd Samuel with 1st and 2nd Kings form one continuous story about total dedication toward God. 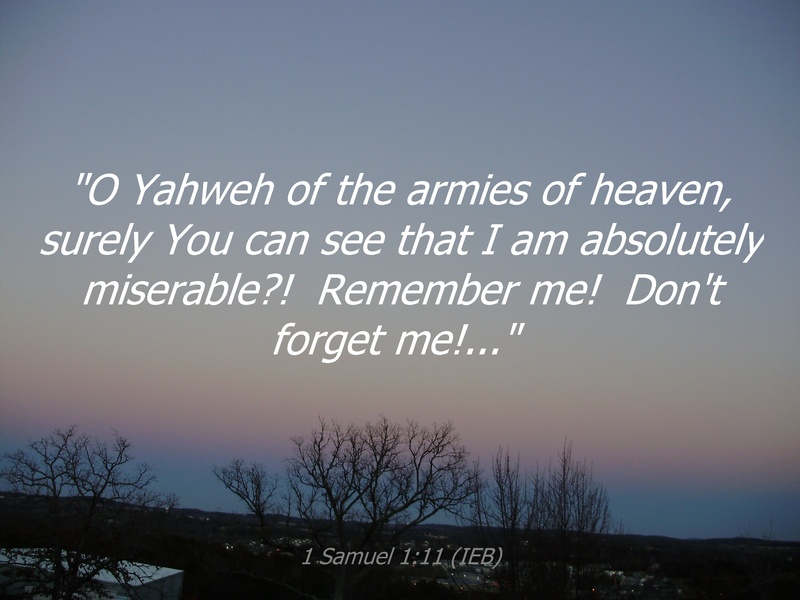 “Samuel (which means ‘heard by God’) was a young boy who was given to God by his mother Hannah, for God’s service under the direction of Eli, the old priest, judge, and leader of God’s people. Samuel was destined to become one of the greatest leaders in the Old Testament. He was a judge, a prophet, and a priest. In the Old Testament God communicated directly to the prophets and they, in turn, spoke to the people.” Today’s study starts with Hannah. 1 Samuel 1:2 (IEB): Elkanah (a Levite) had two wives (b). The name of one was Hannah, and the name of the other one was Peninnah. Peninnah had children; but Hannah had no children. Following the footnotes (b) “Though polygamy was often practiced in Old Testament times, Gen. 2:18-25 plainly shows that God created one woman for the first man (Adam). Therefore, monogamy was the divinely-approved precedent. Also, the prophet Hosea was faithful to one woman, Gomer, which was a figure of Yahweh’s faithfulness to Israel (Hosea 1-3). It is already apparent that Elkanah’s choice to have two wives rather than one as God approved created strife in his household. It brought out the worst in Peninnah and created grief for Hannah. God wants us to be obedient so that it will go well for us. I notice that even though Hannah was tormented by Peninnah, she didn’t respond with hatefulness. She turned to God and poured her heart out to Him. Her actions clearly show her obedience to God, and her understanding that He is in control of everything. Yesterday I started a study of 1 Samuel with the story of Hannah. She kept a right relationship with God by not being hateful to Peninnah and by going to the Lord in prayer with her heartache. Today I will continue the story of Hannah with God’s answer to her prayer. Following the footnotes (b) Conceiving and bearing children is a gift from God. Genesis 48:9; “Joseph said to his father, ‘They are my sons whom God has given to me here'”. (d) “Elkanah had ratified Hannah’s own vow by making it his vow as well. See Numbers 30:6-7, 10-15” for the Mosaic laws regarding vows made by wives. Elkanah had the option of nullifying Hannah’s vow to God as soon as he knew about it, but he chose to honor it knowing that he would be giving up this long awaited son. I leave my study today impressed by the example of Hannah and Elkanah. Hannah wanted to spend every possible moment with her son until the time came that she would honor her vow and leave him at Shiloh under Eli’s care. Elkanah could have selfishly nullified Hannah’s vow and kept Samuel, but instead he honored her and God by honoring her vow. Today I am finishing 1 Samuel chapter 1. Earlier in the chapter, Hannah prayed to God for a son, and he granted her prayer. She made God a promise “If You will only give me a son, then I will donate him back to You for his entire life (for divine service in the tabernacle). And no one will ever cut his hair.” The time has come for Hannah and Elkanah to honor her promise. Hannah prayed for a son and promised if God would grant her prayer she would give him back to serve the Lord. God granted her prayer and she honored her promise. I can’t help thinking how hard that would be! But look what Hannah does next; she “worshiped there in the presence of Yahweh”! (a) Literally, “because I rejoice in Your deliverance.” Hannah now knows that she is no longer barren. Hannah trusted God, she kept her promise to Him, and rejoiced in the Lord. And He continued to bless her. In this world of instant gratification it is sometimes hard to see that God has a bigger plan. I leave my study today grateful for this reminder and for Hannah’s example. Samuel has been left in Eli’s care in Shiloh. Today I am reading about Eli’s two sons Hophni and Phinehas who were priests at Shiloh. 1 Samuel 2:12-17 (IEB): “However, Eli’s two sons were evil men. (c) They did not respect Yahweh. The custom of the priests with the people was ordinarily as follows: Every time someone brought a sacrifice, (d) the meat would be ready to cook in a container. The priest’s servant boy was supposed to come over with a three-pronged hook in his hand. And, the boy would normally plunge the hook into the pan, the kettle, the caldron, or the pot. And, whatever that hook brought up out of the container belonged to the priest. That’s how they usually treated all the Israelites who came to Shiloh to offer sacrifices. But even before the fat began to smoke, Hophni and Phinehas’ servant boy would come over to the one who was offering sacrifices and say to that man: ‘Give the priest some meat to roast! The priest won’t accept boiled meat from you! He will only accept raw meat!’ (e) But the man who was offering the sacrifice might say to the boy: ‘Let the fat begin to smoke first, as usual. Then you may take what ever you want!’ But the priest’s servant boy would answer, ‘No! Give me the meat right now! If you don’t, then I will take it by force!’ (f) So, the sin of the young men was very great in the presence of Yahweh. They did not show any respect at all for the offerings which were being made to Yahweh. (d) “See Leviticus. 7:31-35. Verses 11-36 give the law governing a peace offering sacrifice. Verse 31 says “Then the priest must offer up the fat in smoke on the alter….” Specific portions were to be given as a gift to the priest who offered the blood and the fat of the peace offering. (f) “Hophni and Phinehas wanted to take more than the Low of Moses allowed. The people knew what the Torah said, and they were indignant about the naked greed of Hophni and Phinehas. These were the sons of Eli! They should have been totally dedicated to God, but they put their own will above the will of God. The people brought their sacrifices to God, and these men stole it right out of their hands! Right in the place of worship, literally thumbing their noses at the Always-Present One – Yahweh! I leave my study today examining my life; Christ made the final sacrifice for everyone who would believe in Him and obey His commands. Do I treat that sacrifice with the respect and reverence it deserves? Do I make every effort to spend time in His word and be obedient to His will? Am I doing what He wants me to do? Yesterday I read about Eli’s sons Hophni and Phinehas, and the shameful way they treated the sacrifices meant for Yahweh. Today I’m reading about Eli their father and his response to what his sons were doing. I leave my study today convinced that God demands that I show Him proper respect, that willful unrepentant disobedience will be punished, but pleasing God will be rewarded. Following the footnotes for Jer.18:10 (f) Compare Numbers 23:19. God does not revise His principles every time the situation changes like King Hezekiah’s political advisors (Isaiah 31:2). Compare also Hebrews 13:8; James 1:17. As human beings, God gives us the power of choice, and God reacts to us accordingly. Following the footnotes for 1 Sam. 2:34; This was fulfilled in 1 Sam.4:10-11. Eli lost favor with the Lord because he allowed his sons to dishonor Him. It’s clear to me from these passages that God expects my total dedication toward Him. As a parent, I need to do everything in my power to encourage my children to do the same. I need to bring them up in the training and instruction of the Lord. If I don’t teach them to please the Lord, the world will teach them to please themselves.